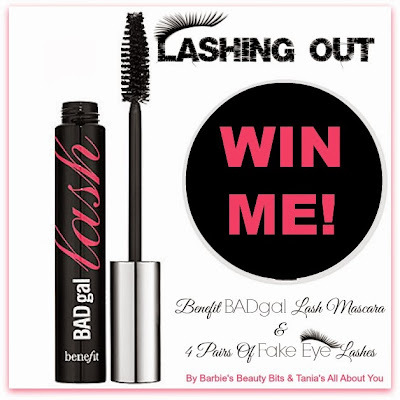 Congrats To Teresa K. You are now a BADgal, with BADlashes! Also, thank you to everyone who entered the giveaway! If you were unsuccessful this time around, make sure to enter other giveaways that I do in the future. Be as BAD as you want to be with this pure unadulterated black mascara from Benefit. The BADgal lash mascara was Temptalia Readers' Choice Award, for the best masacara. And now it can be yours for FREE! Additionally, you will also get 4 pairs of fake eyelashes, enabling you to really lash out in 2014! Simply use the rafflecopter below and enter to win! A special thanks to my co-sponsor, Tania Neff, with Tania's All About You Nails. Hi! New follower via bloglovin'. Found you via the Happy Kids hop!